My two best friends since 4th grade, Katie and Jessie. 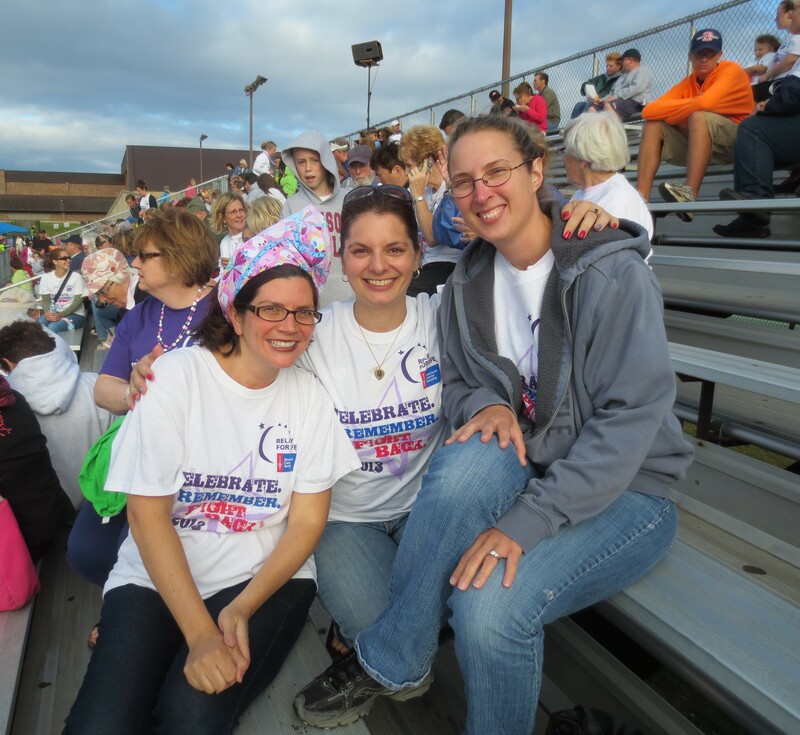 On July 26th, I walked the Relay for Life in White Bear Lake, MN. I previously wrote about why I was walking. Here’s my follow up to the event. I don’t know what I expected at the Relay. The only thing I had to compare it to, was the Susan G. Komen 3 Day for the Cure, which I walked twice. I expected a lot of hype, and everything to be a big hoopla. It wasn’t. It was fairly low key in comparison. That is not a bad thing, it was just different. There was a ceremony, in fact, there were several over the night. At the beginning of the evening, they had the Opening Ceremony, followed by the Survivors’ Lap. Just after dark, was the Luminaria Ceremony, when they turned off all the stadium lighting, and the luminarias lit the way around the track. That was followed by a lap in Silence. In the morning, was the Closing Ceremony during which balloons were released with “messages to heaven” for those who lost their battle with cancer. Sadly, I missed this ceremony, as I thought I had about 15 more minutes before it started, and was bringing things out to my car. I did happen to catch though, that $208,000 was raised through this event for the American Cancer Society (ACS). As with any event that is raising money for a charity, there were speakers that gave their stories. It was emceed by a local weatherman, Dave Dahl, who had his own battle with skin cancer a little over a year ago. I would have loved to hear him talk about it, but he didn’t. There were Boy Scouts to lead us in the Pledge of Allegiance, and hold the flag for the National Anthem. The White Bear Lake cheerleaders helped with every step of the evening. Don’t get me wrong, I’m not saying it wasn’t a big deal, just different than I expected. Michael takes a minute to remember his Great Grandpa Fred, who he shares a middle name with. Part of the night was really sad, like watching my two best friends stand up when they were recognizing Caregivers. I could tell both of them were reliving in their minds what it was like watching someone they loved fight for their lives, and eventually slip away. They are both stronger than I am… I don’t think I could handle that. I can barely even handle visiting someone in the hospital when they are injured or sick! I always say the wrong thing to those I know who are battling cancer, sometimes saying nothing at all, or focusing on their cancer when they might just want a normal conversation. In short, the Caregivers, the people who are there every day while cancer patients fight for their lives deserved the honor they received! Equally as heartbreaking was during the Luminaria Ceremony, Grace started crying, talking about her Great Grandpa Fred who died of cancer a few years’ back. We lived in the upstairs of his duplex for the first 3 years of her life. We also used to go up to the lake camping with him fairly often in the summers when she was little. I tweeted a few times during the night… tried to catch a few stats. When we first got there, different health care organizations had tables set up on one end of the track. They were giving marketing items away (pens, notebooks, stickers. squishy balls, etc). Unfortunately, they all left fairly early, so I didn’t get to see what they all were. My chiropractor’s office was there giving out free massages. I waited too long, and they left right after the luminaria ceremony. I was kind of bummed I missed my window to get a free 5 minute massage. That would have been wonderful! There were some teams that were walking in the relay who were giving out bandanas, and bags with pedometers (thank you Walgreens) throughout the night. There was a support tent for survivors, and a tent where people were donating their hair to Locks of Love. I have donated my hair at least 2-3 times. I think I will grow it out again to donate there next year! 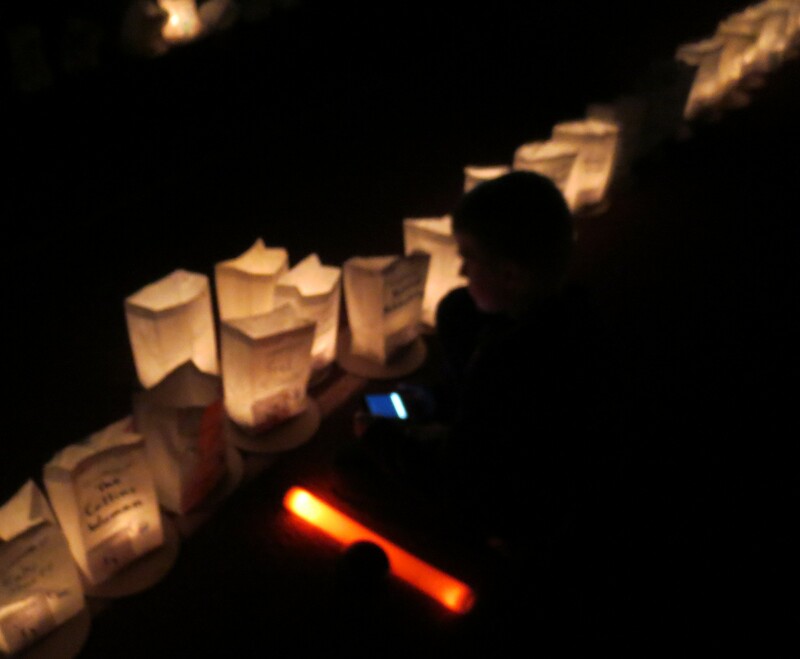 One thing I really enjoyed about the Relay for Life, was how family-friendly it was. My kids ended up needing to come with me (not originally planned). Luckily, they were able to walk with me. There was also a tent set up for the kids to sleep in. My friend Katie had her two kids there for the night. Their dad came after he got off work. He walked several laps with us, and was going to take their two kids (Amelia, 4, and Jensen, 5) home, but they were having so much fun with my two kids, they ended up staying the night. People were free to come and go as they wanted/needed. I really appreciated that about this event! Michael’s favorite thing about the Relay was “all of it.” His most favorite thing though, was hanging out with Jensen and Amelia. Grace’s favorite thing about the Relay was the “luminaries and how they shut off all the lights at night, and we got to walk with the luminaries lighting up the track.” She also liked how she got to walk with us, and the “beads and the bracelets.” The beads Grace was talking about were from a group called “Laps of Love.” For just $1 (which went back to ACS), we could buy a bracelet. 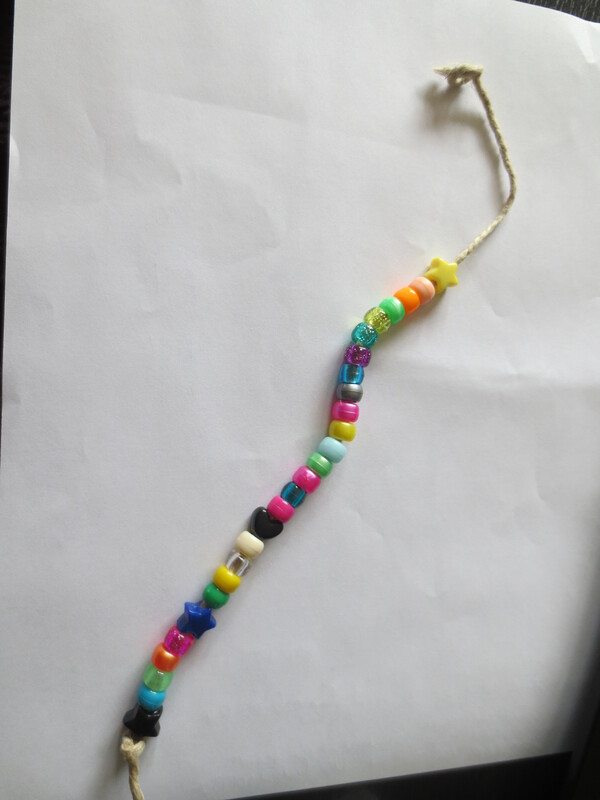 Every time we made a lap, we could stop and pick out a bead to add to our bracelet. For $3, you could buy a necklace. I was amazed that some people almost filled their necklaces. If it weren’t for a freezing cold night (at one point we could see our breath), and taking breaks with the kids (plus the hour and a half in the middle of the night I attempted to sleep), I probably would have gotten more laps in. The nice thing about having older kids, is I didn’t need to be watching them every minute. I could let them go off and play, and keep an eye on the littler ones, and be able to enjoy the night. I have blogged in the past about all the lessons I learned while walking The 3 Day. Why I didn’t follow my own advice during the Relay? I have no idea! My feet were so sore by the end of the night, and it was nothing compared to 60 miles!! Next time I do the Relay for Life, I will remember to Vaseline the bottoms of my feet, bandaid my pinky toes, and wear double layers of socks. I remembered that one in the middle of the night when I changed my socks halfway through the night. It was so cold, I put my “old” socks back on over my new ones, in order to try to keep my feet warm enough. The bottoms of my feet felt so much better once I had the second layer of socks. The morning after the Relay, I felt super dehydrated. I know how important it is to keep drinking water while walking… not sure why I didn’t drink enough… I also didn’t eat enough food, and what I did, was mostly snack-food. Next time, I will eat better food the day before, and during the night. I will also make sure to drink enough water. The Relay for Life was a wonderful experience. I look forward to doing it again next year! I forgot to mention that they did have a Silent Auction inside the school. We were also able to escape the cold to go inside to use the bathrooms. I was thankful for those moments of escape!